Going camping can be a challenge, and even more so with kids. 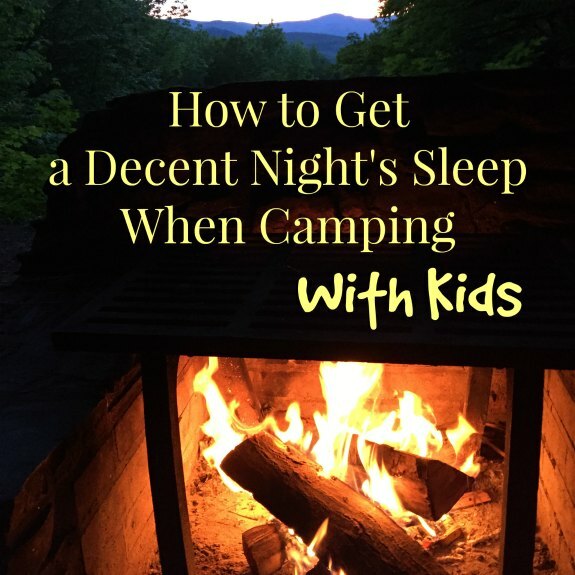 I don’t think I ever slept particularly well when I went camping, and taking young kids has definitely meant lots of sleepless nights. Here are some tips for getting a decent night’s sleep! ~ You might want to consider air mattresses, or at least very good mattress/camping pad (for campsite camping, not backpacking). Before I had kids, I used to backpack with a sleeping pad, but now it is easier just to use an air mattress for the whole family. The last thing I need is to wake up stiff and achy, or on the ground because my little ones have pushed me to the corner of the tent! ~ Avoid trips to the bathroom. Keep track of when the kids have their last drink of the day, and limit what they (and you!) drink, to avoid the need for any trips to the bathroom in the middle of the night. Not only will you spare the trip to the bathroom, but chilly nights and the possibility of scared kiddos (I vividly remember my toddler being absolutely convinced there were bears in the woods that were going to get us on our walk to the bathroom in the middle of the night!). ~ Prepare for warm/cold. An evening may start out mild and become cold, so prepare layers of clothes that are easy to grab if you wake up cold. I remember one night when the kids woke up very unhappy because it was unexpectedly cold – however, I had packed winter hats on a whim – and it was a lifesaver for all of us! ~ Offer comforts. We have had some experiences that the kids found upsetting, mostly because it was all new for them, so just keep in mind that kids can have anxiety. Make camping comfortable at night and be prepared to ease their anxieties. Pair off a parent with each kid so that they have an adult to snuggle with at night. Bring some comforts of home. Bring a lantern or portable nightlight so they can fall asleep with a light on, and make sure a light is always handy. Every child is different but it can’t hurt to be prepared! We’ve been there – so here are some examples of things that we worked through my daughter was convinced there were bears in the woods – especially after seeing a sign that had been posted because bears got into the dumpsters at the ranger station, the kids being scared by scary campfire stories, skunks getting into our stuff in the middle of the night and having to “shoo” them away without the kids waking up and panicking (or the skunks spraying), one of the most intense thunder/lightning storms going right over us (fortunately we were in a leanto). Camping is an experience, but the great part is that it will make for some pretty awesome stories later! ~ Keep comforts nearby. Keep things on hand that you might possibly need, from lamps to headlights, tissues, a book if you can’t sleep, and so on. For little ones, sometimes that meant a bottle of milk ready to go in the middle of the night. ~ Early morning activities. At home, we use blackout curtains, so when we go camping, my kids are up very early. It helps to have some activities on hand, whether it is books, books on CD, or other quiet activities. Although you might not be able to sleep in to a normal time, at least you can keep your morning low-key. Plus, you want to be conscious of other campers around you who might not be awake that early. Camping with kids is a lot of fun, but the key is being prepared! Have fun making lots of great memories!